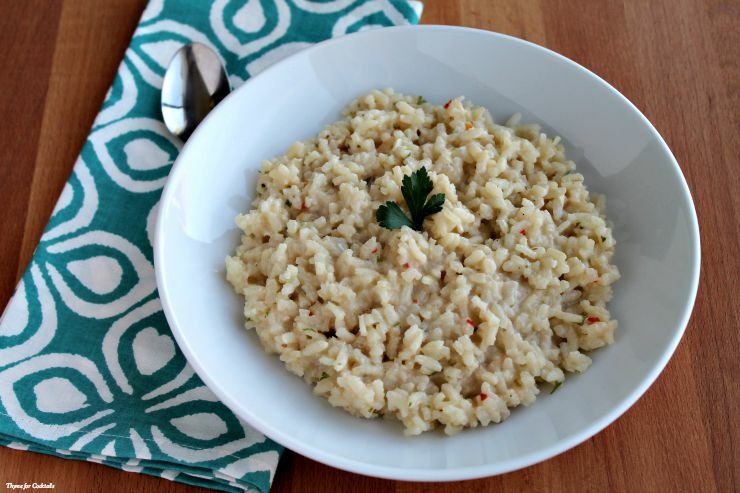 Creamy Smoked Gouda Risotto is a delicious, elegant addition to your next quite meal at home. Arborio rice slowly cooked with shallots, garlic and white wine then finished off with smokey gouda cheese and heavy cream. 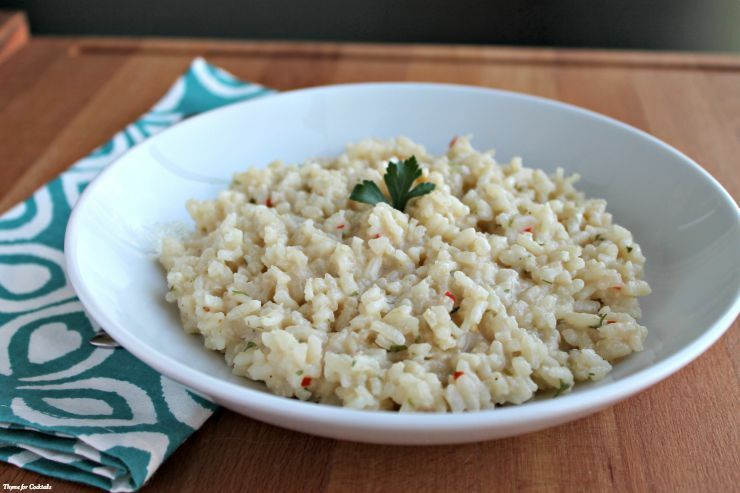 Risotto is a dish that intimidates a lot of cooks. Mention it to a group of foodies and at least one person has a culinary horror story revolving around the dish. It is not a complicated dish, it just takes time and patience. 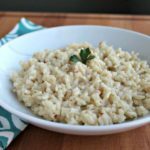 [bctt tweet=”Elegant, delicious Creamy Smoked Gouda Risotto #risotto #foodie #dinner “] I taught myself early on in my blogging adventure to make risotto. My early attempts weren’t horrible and now, after a little practice, I actually find the process therapeutic. It forces me to slow down and focus on the task at hand, something I haven’t been doing much lately. Last week was pretty rough at the casa, work pressures and deadlines have been overwhelming both Paul and I, there were numerous activities with the kid and for the blog plus I discovered a dear friend is dealing with a pretty significant personal issue. By the time Thursday rolled around I barely had the mental energy to post my Charred Broccoli recipe. 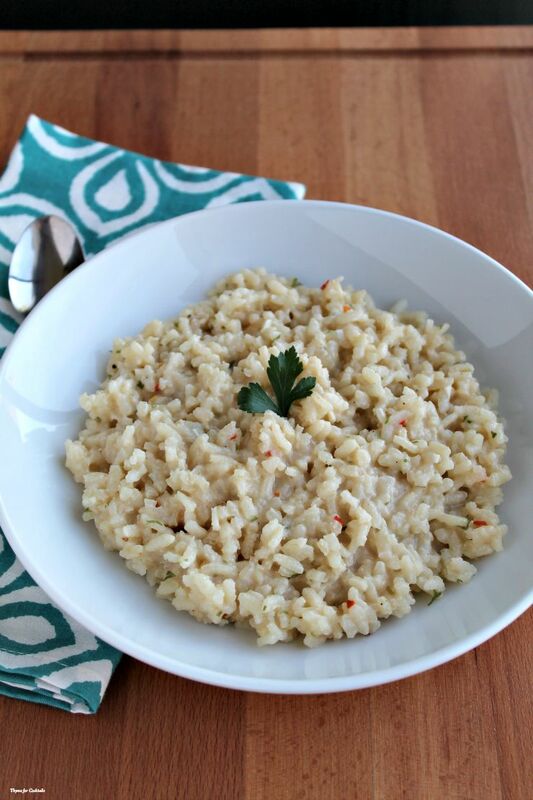 Creamy Smoked Gouda Risotto has arborio rice slowly cooked with shallots, garlic and white wine then finished off with smokey gouda cheese and heavy cream. Heat a medium saucepan over medium low heat. Add oil, shallots and garlic, saute 2-3 minutes. Add rice and seasonings, cook 1 minute until rice translucent. Slow add wine, stirring continuously. Continue to stir occasionally until wine is almost absorbed. Add 1/4-1/2 cup stock, stirring occasionally until almost absorbed. Repeat with remaining stock until risotto reaches desired consistency. Remove from heat, stir in cheese and heavy cream until throughly combined. Serve immediately.